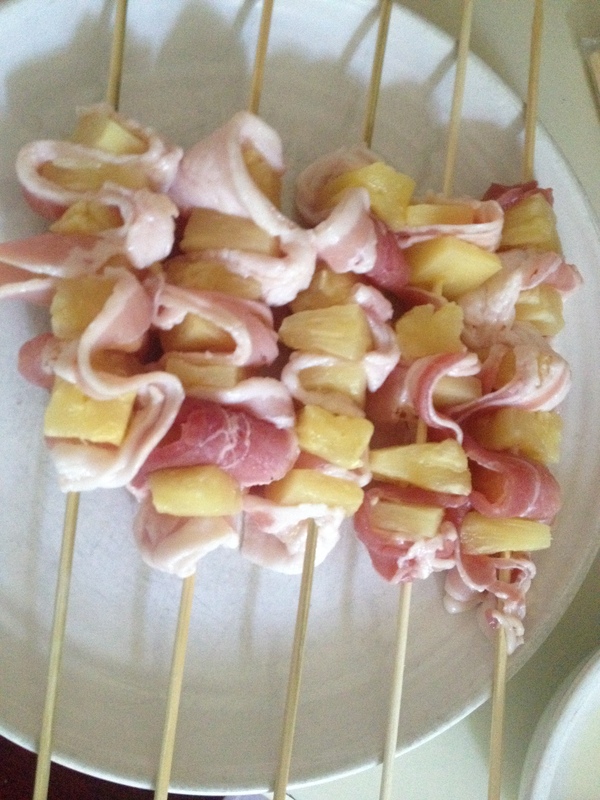 Bacon pineapple kebabs…they’re going to be a thing from now on; mark my words. What I love about this recipe is obviously the sweet juiciness of the pineapple combined with the smoky flavor of bacon, but also how simple it is to put together and how versatile it is. You only need three ingredients– bamboo skewers, pineapple, and bacon– but you can add whatever else you want to the stick. Halfway through putting them together, my mom suggested pepperoncini peppers and, when I ran out of pineapple chunks, she handed me a package of dates. I thought perhaps some pearled onions or onion petals would be a great addition for the next time. 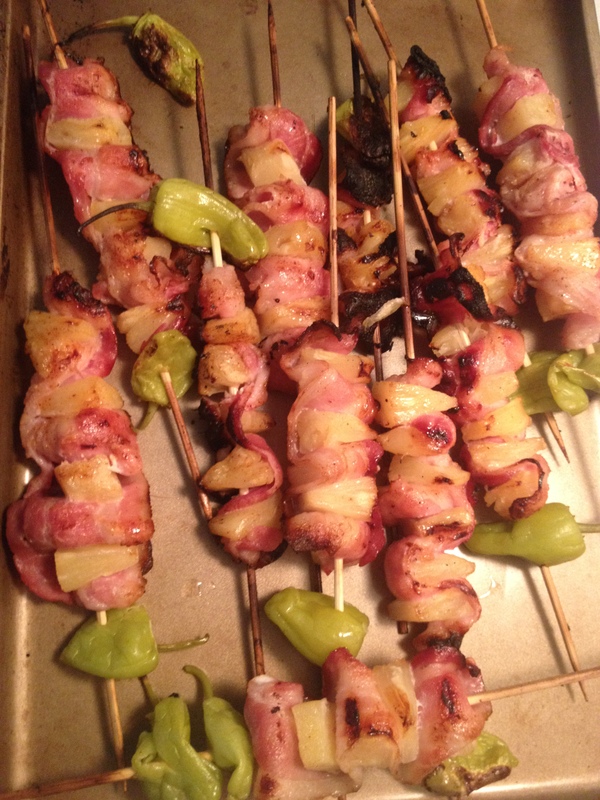 We used two packages of bacon and two cans of pineapple chunks and there was about 2-3 skewers for all 7 of us. For seasonings, we used Lawry’s seasoned salt. Start by taking the end of the bacon strip and poking it through the skewer, making sure you stay relatively close to the end of the stick and then push everything up once it’s all on board. Follow-up with a pineapple chunk then a layer or two of bacon (depending on how long the strip is), then pineapple…you get the idea. What surprised me most about this appetizer was that they don’t cook as quickly as I thought they would. I told my stepdad to place them on the grill as burgers and hot dogs started coming off, but he ended up having to put everything on together at the same time because they were just cooking too slowly and wouldn’t be done before dinner. In addition, the skewers were starting to char black because we made a rookie mistake of not soaking the bamboo skewers first. In the end, we took them off the grill and placed them under the broiler for a few minutes and, as it turned out, everything was finished at the same time. My recommendation: keep an eye on them as you are cooking. Remember, this isn’t a “foodie” blog! In the end, the kebabs were a huge success with the family, especially my brothers who said it reminded them of Papa John’s Hawaiian pizza. I’ll take that. For a part platter, you can also cut the bacon into slices that wrap all the way around the pineapple chunk and skewer everything with a toothpick. Stay tuned– next year, it’s possible I’ll have come up with some sort of dipping sauce for these bad boys.